Courage Campaign | Tell your Representative: "Stand with Bernie: No cuts to Social Security." President Obama just doesn't seem to understand. Social Security is not on the table for negotiations with the GOP during budget talks, period. Senator Bernie Sanders gets it. He's vowed to do everything in his power to protect Social Security, forcing the very wealthy to make up the budget gap by paying their fair share in taxes. We need his colleagues in the House to say the same thing. No cuts to Social Security -- make the uber wealthy pay their fair share instead of America's seniors. We need leadership in California and around the nation. Tell your member of Congress: "Stand with Bernie. 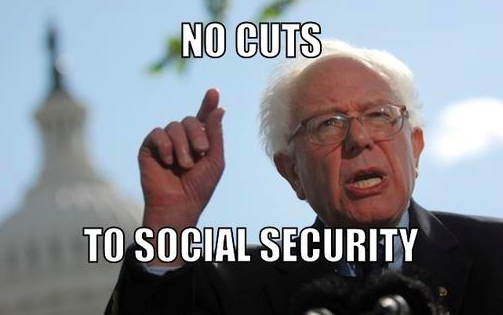 No cuts to Social Security." Protecting Social Security is non-negotiable. While the 1% hide billions in offshore accounts, many American seniors are lucky if they find an extra $20 that wasn't already slated for necessities like food, housing, or medical care. It's not fair, it's not right, and it's not up for debate or negotiation. Tell your member of Congress to reject any budget that cuts Social Security by signing here. We'll make sure your voice is heard in D.C.